In this post I will discuss average assisted conversion metrics for retail and travel websites in Google Analytics according to The Wolfgang E-Commerce Benchmarks 2016 Report. The % represent the proportion of assisted conversions attributed to this channel. They add up to more than 100% because there is more than 1 assisted conversion per conversion on average. E.g. Social – PPC – Organic (conversion) will attribute the conversion to Organic and one assist each to Social and PPC. The fact that our assisted conversions add up to 177% tells us that there are 1.77 assisted conversions for every conversion or 2.77 clicks on the average conversion journey. 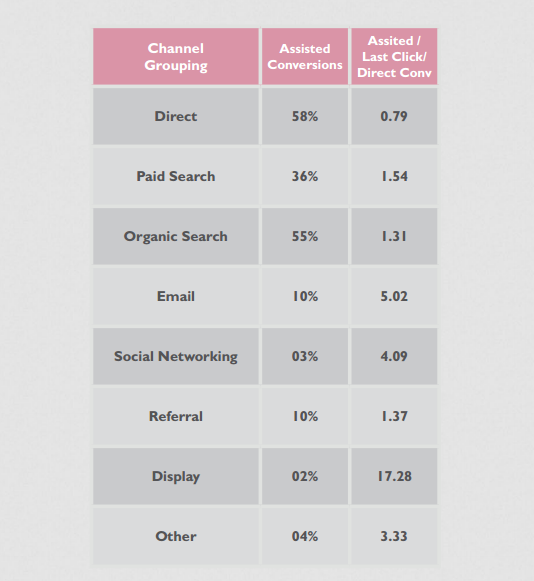 Direct – Highest proportion of assisted conversions. This makes sense if you consider the types of traffic that make up direct. Direct mops up returning customers as well as returning visitors, both of whom are more likely to convert. Direct also mops up traffic from above the line advertising. Google Organic & Paid Search – The other key contributors of assisted conversions. If you view Google as one channel it is easily the largest source of assisted conversions and consistanty delivers the highest average order values of all digital channels. Given that Google drives 67% of “last-click” revenue it’s no surprise it plays a major role in delivering assisted conversions. Email – Email assisted 10% of conversions. What’s unique about email was it was an interaction initiated by the advertiser. They mailed their database and this propelled people to visit the website and buy. The prospect initiated the interaction in the other top assisting channels. Assisted/Conversions. This metric is a little harder to wrap your head around. For every conversion, how many assisted conversions did we get? When the number is above 1 this tells us this channel tends to be a TOFU (top of funnel) touchpoint, when it’s below 1 it tells us it’s a BOFU (you guessed it!) touchpoint. Email and Display are the standout figures here, with email delivering 5 assists for every conversion and display delivering 17 assists for every conversion. It worth mentioning that Facebook is getting a raw deal in terms of measurement here. At present Google Analytics is not good at measuring cross-device conversions for the majority of websites. Facebook’s traffic is 91% mobile. We’ve already deduced that mobile is the research device and desktop is the transaction device. So conversions that started on mobile and finished on desktop won’t show the mobile Facebook assist. My gut tells me if we were tracking cross-device conversions Facebook would be a power player when it comes to the assist. You can read the full E-commerce Benchmarks 2016 study here, or check out the easy-to-digest infographic here.